"I, Daniel Johannes Kruger do solemnly declare that the above answers made by me to the above questions are true, and I am willing and hereby voluntarily agree to serve in the Military Forces of the Commonwealth of Australia within or beyond the limits of the Commonwealth." The questions mentioned above refers to a form which is titled "Australian Imperial Force - Attestation Paper of Persons Enlisting for Service Abroad". Daniel stated that he was 32 years and 6 months old and a carpenter. He had served an apprenticeship of five years at Walters & A. Gray of Cape Town. He gave his place of birth as follows on a this pre-printed section of the form: In the Parish of Colesberg in or near the Town of Cape Colony in the Country of S. Africa. The first interesting fact in this story is that Daniel signed this form at the Dubbo Depot Battalion in the town of Dubbo in New South Wales, Australia. A fair distance away from South Africa. Daniel's military records also give us some insight into his features. He was 5 feet 6 inches tall, weighted 119 pounds, his chest measurements were 30 and 33 inches, his complexion was tan, his eyes were brown and his hair was black. He had two distinct marks, a scar on his right thigh and a scar on his left elbow. The records also tell us that he was not married and that his religious denomination was Dutch Reformed Church. His place of residence was Commission Street in the town of Cooma, New South Wales. Daniel Johannes Kruger was born on 5 January 1884 and was the seventh child of Gert Hendrik Jacobus Kruger and Susanna Jacoba Viljoen. His baptism on 2 March 1884 was recorded in the baptism register of the Dutch Reformed Church of Venterstad, Cape Colony in South Africa. It is not yet known when or why he left South Africa and how he ended up in New South Wales, Australia. On 19 July 1916 he became a member of the 13th Battalion, 21st Reinforcement as Private Daniel Johannes Kruger No 6549. He would soon be fighting in the trenches of the Western Front in France. Australia's commitment to the World War 1 was significant. A total of 331,781 troops served during the war of which 137,013 were wounded and 60,454 were killed. Little did Daniel know that he too would be one of the wounded and that his military records would soon be stamped MISSING. In Sydney Daniel embarked on the troop ship Ceramic, which departed for Plymouth on the 7th October 1916. After a six week journey they arrived on 21 November 1916. Finally on the 8th February 1917 aboard the SS Princess Victoria, they proceeded to the front in France. Two months later, on 11 April 1917, Daniel's records shows an entry: 13th Bn - Reported missing France. This entry is later followed on 14 April 1917 C/O Battn Missing in action - France. Then there is an entry which could possibly refer to a telegram or a cable: Delete missing read prisoner of war. Captured (wounded) Interned Soltan. There is also a note in his records with a reference to his country of birth, Role shows Father Gert Kruger, Post Office Bult Station, Piet Retief, Transvaal, Sth Africa.This suggests that his next of kin had been contacted. It must have been a worrying time for his parents, not only was their son living abroad but he was now a wounded prisoner of war. There is bit of irony in this story. Daniel was captured fighting the Germans and was now being held not that far from where his German progenitor had lived prior to departing to the Cape of Good Hope, South Africa in 1713 in his own quest for a better life. The next entry in his military record is dated 24 December 1918 and states Returned to England. On 31 December 1918 he was back on the strength of 13th Battalion. There is a note that stated Sick to Hospital 19.2.1919 and finally a stamp RETURN TO AUSTRALIA 31.03.1919. He arrived back in Australia on 13 April/May1919. Upon his return he was assessed and was found to be suffering from Epididymitis (left side) and a weakness in the joint of his index finger of his left hand. Not a good situation for a carpenter, who used his hands to earn a living, to be in. The records show that his discharge was deferred for further medical treatment. After undergoing this treatment his condition was reassessed on the 19th June 1919 and he was finally discharge on the 27th July 1919. During his time as soldier, Daniel was awarded the Victory Medal (no 55912) and the British War Medal (no 57576). Two questions remain. Where was Daniel a prisoner of war? What happened to Daniel after the war, did he remain in Australia and marry? The question about Daniel’s life after the war still remains a mystery but German war records helped to answer the first question. Daniel was captured at Reincount in France and suffered a shrapnel wound to his left hand. After being treated at the Munster (Lager) Hospital he was interned at Gefangenenlager, Soltan, Germany. 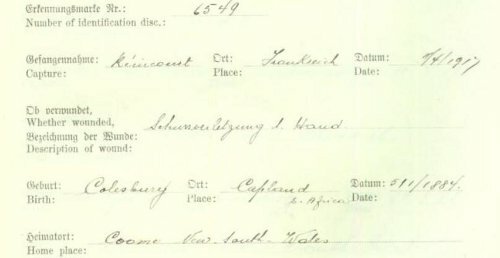 The German record above shows his home town as being 'Coome', New South Wales. 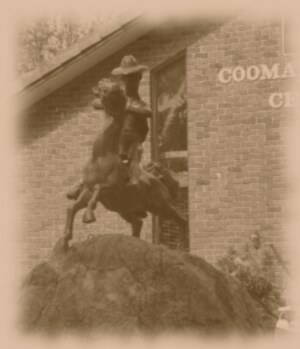 Until the 1950's Cooma was a sleepy town of about 2,000 people which catered for the large pastoral district of the Monaro planes. This all changed when the Snowy Mountains Hydroelectric Scheme began in 1951. In one of the parks in Cooma there is a statue of A.B. (Banjo) Patterson's well known 'Man from Snowy River'. A further search has revealed that Daniel was not the only Australian captured. 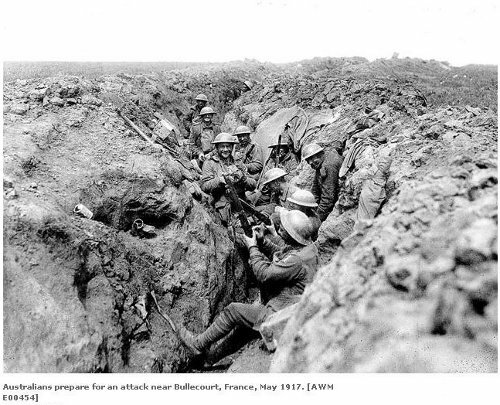 On 11 April 1917 the Fourth Division, which included the 13th Battalion, assaulted the Hindenburg Line in the First Battle of Bullecourt. The attack was not successful as they attacked strong German positions without the promised tank support and 1170 Australian prisoners were taken by the Germans.